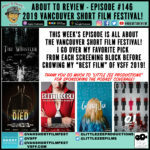 I was fortunate to be asked to cover the 9th annual Vancouver Short Film Festival for the 3rd year in a row, and it was incredible as always! On this episode I break down my favorites from each program before crowing my best of the festival! 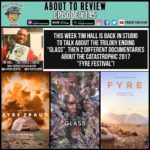 On this week's episode Tim Hall (The People's Critic) and I discuss if "GLASS" is a trilogy that will go down in history, as well as two documentaries about the same festival that have very different view points: "Fyre Fraud" and "Fyre".